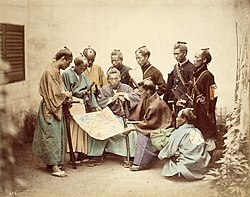 Matsudaira Yoshinaga, Date Munenari, Yamanouchi Toyoshige and Shimazu Nariaki are collectively referred to as ญี่ปุ่น: Bakumatsu no Shikenkō โรมาจิ: 幕末の四賢侯. ↑ ที่มา: The Emergence of Meiji Japan, Marius B. Jansen, p.175. Dower, John W. "Yokohama Boomtown: Foreigners in Treaty-Port Japan (1859–1872)". Ravina, Mark. Last Samurai: The Life and Battles of Saigo Takamori. Hoboken, N.J.: John Wiley & Sons, 2004. ISBN 0-471-08970-2. Mark Metzler (2006). Lever of empire: the international gold standard and the crisis of liberalism in prewar Japan. University of California Press. ISBN 0-520-24420-6. หน้านี้แก้ไขล่าสุดเมื่อวันที่ 9 กรกฎาคม 2561 เวลา 20:13 น.